The White Mountain National Forest of New Hampshire is home to the *Grand Summit Resort Hotel - Attitash* at Attitash/Bear Peak. 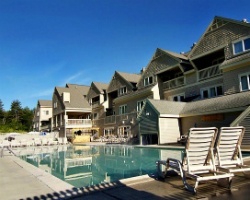 This all-season resort is situated right on the slope of the Attitash Mountain recreation area, only 15 minutes from Mount Washington and 10 minutes from outlet shopping in North Conway. Every season at the Grand Summit will bring exciting new activities to enjoy including an alpine slide, triple water slide, hiking, horseback riding, fishing, and golf. Known for its exceptional top-to-bottom snow-making and manicured slopes, you will take pleasure in hours of skiing and snowboarding! During your stay, the resort's studio, 1-, 2-, and 3-bedroom suites will provide you with all the comforts of home. Come to New England and get to choose your week at this year round resort! Buyer May Receive A Title Fee Credit, Inquire For Details! Come to New England every 4th week in the year! Enjoy the outdoors! Buyer May Receive A Title Fee Credit, Inquire For Details!